The 2006 Rhino reissue with bonus tracks is the version I own. This album was recorded between 1994 and 1996 and sports a pretty updated metal sound right in line for the time it was released — 1997. I’m surprised by how many songs have stuck with me through the few times I listened to this album. Listening back to this I’m going, “Oh yeah! I remember this song!”. Tipton is really showing himself here as a great vocalist showing a lot of different styles. The album is definitely metal, but album covers many subgenres such as punk, alternative and thrash but it still manages to sound Priest-like at times. But to say this is a Priest-wannabe doesn’t do the album justice. 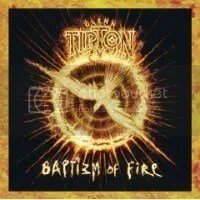 Baptizm of Fire stands on it’s own as a good heavy metal album by one of metal’s best songwriters. Definitely worth a look for Priest fans and metal fans in general. I have to point out that “Extinct” is an especially cool song that sounds like it would be a perfect fit on the soundtrack to The Crow (which I loved).